RV Appliances sure have advanced over the years. Not all that long ago, you were pretty fortunate to have a small RV refrigerator, a 1 - 2 burner stove and perhaps hot water? Now, you can have all the modern conveniences of home - while driving away! Course, some of these RV Appliances will require special planning. Once you realize it, there are quite a few devices to learn and understand. From this page, we will have direct links to full description pages and various manufacturers as well. The size of your RV will typically determine the size of your RV refrigerator. The price of your RV will then help determine the type of refrigerator. 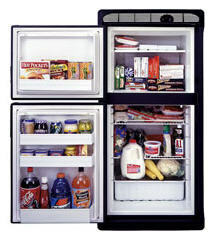 For years, most refrigerators have been a single door type and didn't freeze. Then along came advanced that could freeze (2 door). Next was the conventional looking refrigerator/freezer - 4 doors! Wow, quite the advancement. All of these are powered by either conventional 120 Volt AC or 12 volt DC while using Propane as a "Gas Absorption Refrigerator". These advancements allowed RV'ers to become quite mobile while allowing frozen to stay frozen, etc. Lately, the big deal is a conventional "house-type" refrigerator. It does not use propane - it must have 120 volts AC - all the time?!? Kinda defeats the concept of RV'ing!?!? But, it's progress. right? 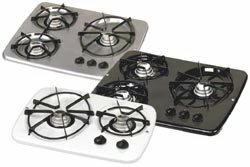 RV Appliances haven't changed too much when it comes to stovetops? Several things to be aware of though. As usual, space constraints seem to take over - not sure if some of the designers have ever actually cooked on the stovetops they put in RV's. Seems like they are just for fluff and the L.E.O. (Let's Eat Out) Club members only! If you like to cook, at all, be aware of the number of burners you get and the space around them. Some are so tiny within their space that only very small pan(s) will actually fit on the burners at the same time. The Hot RV Water Heater has advanced also. Now, they have electronic ignition starter circuits to make them much more dependable. Years ago, you risked your hair and eyebrows while trying to light one, by hand! Most are either powered by Propane or 120 Volt AC. The larger ones will function either way. There is also a hot water heating system on expensive RV's that provides hot water for showers, etc just as a boiler would - always on and ready. These are usually diesel powered, propane is available for a gas powered Class A. Roof AC looks and functions pretty much the same as always. R-12 Freon is no longer used within the systems, however. The more expensive RV will have the roof AC unit(s) push the cooler air through vents in the ceiling to various outlets. The less expensive RV may have the cold air coming out of the unit itself directly. Something I just can't seem to get my head around is a black/dark roof with a matching dark/black cover over the roof AC unit ?? Why would you want a device that has to produce cold air baking in the hot sunlight with a black or dark cover/roof ?!!? RV Appliances haven't really advanced at all with these! Your convection oven microwave still needs real power - and plenty of it - to operate. They will only work with either shore power or the generator cranked up. As you might suspect, they aren't real large inside either! RV Furnaces are mostly Propane fueled and hot air blower types. The exception (as always in an RV Appliance!) is in the more expensive Class A RV's that will have a hot water type system. These will use hot water to heat the air and have a special boiler type system that is usually powered by diesel fuel. Today's RV Furnace is designed to protect the occupants very well. As an example, the blower will always come on first, run for about 8 seconds and then "spark" the propane to start providing heat. It does the same thing when shutting off - the flame will go out while the blower still runs. All of this is designed to keep any propane gas from accumulating within the furnace to start a fire, upon the next "start-up". The hot air type is usually a pretty compact heater, therefore not providing a lot of vents throughout the RV - but they do keep the chill off. Cold weather issues? Yes! Unfortunately, most of the duct work/vents are within the people area of the RV. Very few will run the heated air through vents in the undercarriage. 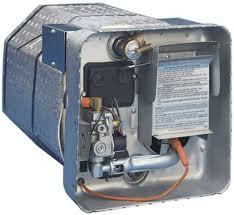 Therefore, the furnace does NOT really provide any heat in the water storage areas or plumbing of an RV!! Yes indeed - RV Appliances are big here! The larger and more modern RV of today will have a compact single unit Washer/Dryer. Again, if space isn't an issue, you can order a Stackable washer and separate dryer unit. Many RV's can also be ordered with the vent and plumbing installed for a later install of a washer/dryer, as well. If ordering a new RV, do yourself a favor and order at least the plumbing and vent be installed - even if you are going to use the area as a storage closet! It will be so much easier to add a washer and dryer someday! May as well go here too! RV Toilets are different! They are designed specifically for RV's. 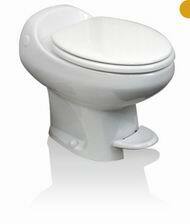 It is usually placed on a "raised floor" to allow a special flush valve to operate. The waste goes directly to the Black Tank, right below. They are also designed to use minimal water - not like your house style one!